I once worked at a printer supply store, and we had an intern who was always mentioning he knew everything about hardware devices and got mad whenever we proved him wrong. When April Fool’s Day was around the corner, my colleagues and I mailed ourselves a nice “legit” box of supplies containing “raw toner” (a box full of charcoal, and a pimped-up cheese grinder). We even attached fake invoices to make it look real. When the box arrived, we told him he had to receive the box, and turn the “raw toner” into fine powder and fill a laser print cartridge. We told him the customer needed it done immediately. He spent the best part of the morning grinding charcoal and bragging loudly how he was the best toner maker we ever hired. Meanwhile, half of the crew was laughing uncontrollably in another room and taking turns watching. By lunchtime, he was sweating and covered in charcoal from head to toe. We finally told him it was a joke and if he’d ever put that on a printer it would light up in a blast of fire. He was furious, but laughed about it later (okay, a year later). From then on, we called him CB, for “Charcoal Boy,” and whenever we had a company barbecue we always asked him for some raw toner to light up the grill. My daughters treated me to three upside-down water glasses with a note reading “Have fun cleaning this up!” LOL! It wasn’t fun to clean up. I still have no idea how they managed to pull this off. A few years ago, I called my parents on April 1. My sister, who was living in London at the time, answered. I was surprised she was there, so I continued on and decided to make her believe I was in London outside her building to surprise her. I was pretending to be really upset. She totally panicked, and was trying to find a solution. Despite the fact I started to laugh, she was still panicking and not realizing it was an April Fool’s joke! 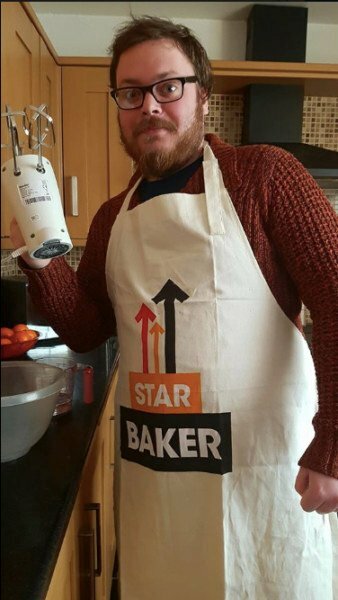 I had everyone believe that I had been accepted to the Great British Bake-Off last year. 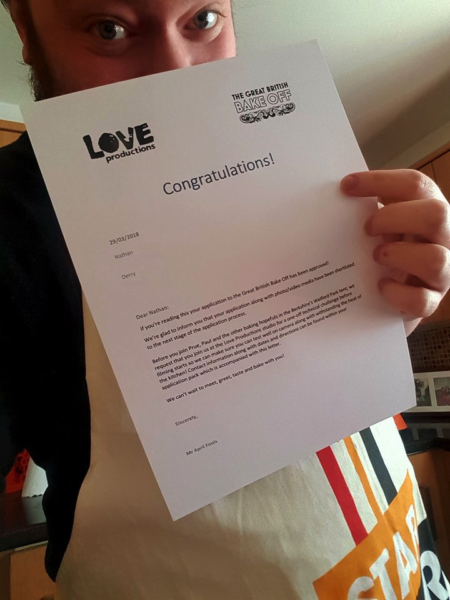 For a few weeks leading up to April 1, I had been baking all sorts of things to lay the foundation for me to post a picture of myself with a Bake-Off apron and an acceptance letter that was signed by Mr. April Fools. I still got asked when I was going to be on the show a few months later. In 1991, a bright-eyed, enthusiastic 10-year-old me witnessed one of the greatest school pranks of all time. The background to this prank is that my teacher at the time was a member of the local historical society. His name is was Mr. Devine. To him, history was everything. Mr. Devine had borrowed several artifacts for our class to enjoy. These included a letter written to the governor of Derry more than 200 years ago. Mr. Devine would often go to great lengths to help us see that history isn’t just a story. He wanted us to know that history is also tangible and real. With the help of another teacher, Mr. Herron, we copied the 200-year-old letter and set about ageing it. Mr. Herron burned the paper in the right places, and someone else took it home and soaked it in tea overnight. On April Fool’s Day, Mr. Devine asked if anyone knew where the historic letter had gone. As planned, a classmate stood up and made a heartfelt confession that he had inadvertently scrawled all over the letter. Mr. Devine did not raise his voice or get angry. He just told us all how disappointed he was, and that he would have to phone the historical society to explain what happened. He went on to say that he would have to resign from the society that had always been his greatest joy. The classmate broke immediately, and soon the whole classroom sang like canaries in summer. Mr. Devine was delighted when we presented him with the original. A few minutes later, he said, “Oh, no! This is the wrong one!” Comparing the two letters, he noticed that the graffiti-free letter was a poorly created replica. He did not blame us, but concluded that Mr. Herron had poorly directed our prank. Mr. Herron took full responsibility and promised that he would make an immediate donation to the historical society. The next day, we found out Mr. Devine revealed the perfectly preserved original. He had known about our plan from the very beginning! Apparently, 10-year-olds are terrible at conspiracy. We had given the game away dozens of times, particularly when we asked for advice on making paper look 200 years old, and when we openly discussed the plan within earshot of him. This gave Mr. Devine plenty of time to create an even lower-quality copy. Then he just had to play our copy off as the original. My kids are getting too old for Elf on the Shelf, but one of their favorite pranks was when the elf taped their doors shut a few years ago. This past year, we beefed it up a little bit, and put Vaseline on the door knob! At a previous company, a group of coworkers had started pranking a fellow worker who was only in the office for three days a week. We told her that another worker named Marie was assigned to use her private office on the days she wasn’t there. We started by leaving coffee cups or a bit of trash in her can. We’d keep referring to this phantom person and had our coworker completely convinced. As time went on, we’d leave her office messier and messier and snicker while she complained about what a slob “Marie” was. When we noticed April Fool’s Day coming up on the calendar, we couldn’t resist. On that day, we revealed the truth to our beleaguered buddy. I think she was most relieved that she wasn’t going to have to go to HR to put in a formal complaint! A few years back, my daughter was really into Disney’s Frozen. She had all the toys, costumes, and even the breakfast cereal. The night before April Fool’s Day, I poured the Frozen cereal into a bowl with milk and a spoon before putting it in the freezer overnight. It was frozen Frozen! This entry was posted in Offbeat by ModSquad. Bookmark the permalink.